MacArthur, who felt that the "Matsumoto Committee Proposal" that appeared in the Mainichi Newspaper on February 1 was not sufficient to attain the democratization of Japan and that it did not represent the public opinion of the country, ordered Government Section to draft a Constitution. He gave them orders to include three provisions that he considered must be included in the draft Constitution. These three provisions are known as the MacArthur Notes. One of the three provisions was the origin of Article Nine, which stipulates the renunciation of war. 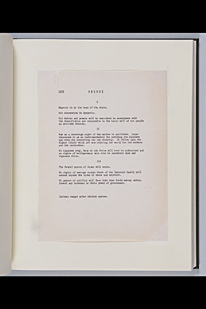 As shown in this document, MacArthur specifies that war be renounced "even for preserving its own security".